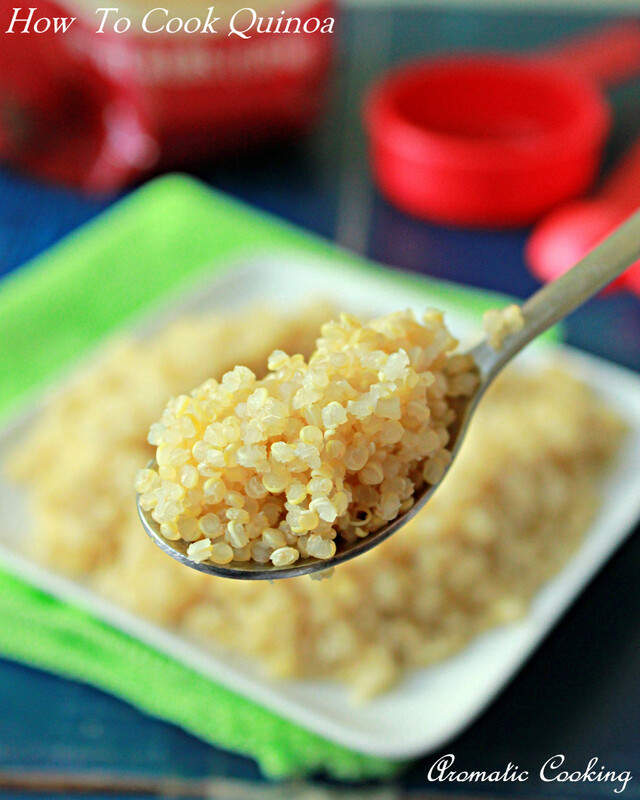 Quinoa is a fairly new grain, only 3 or 4 years back I got introduced to this wonder grain (it's not a complete grain, they call it as a pseudocereal). It was not love at first 'taste', in fact it was many months later that I tasted it again and only after that I slowly started to use it in day to day cooking. I usually try to replace rice with it, it's very rich in fiber and protein and has a slightly nutty taste. 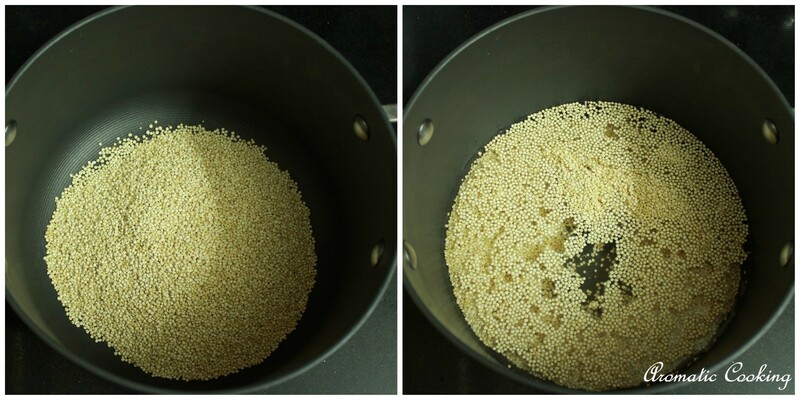 Cooking quinoa correctly might be tough for first timers, so I thought I'll do a basic post about cooking it..
Take the quinoa in a deep non-stick pot, which you can use for cooking rice, add 2 cups of water. Bring it to a boil, then reduce the heat to medium, cover and cook for about 7 minutes. 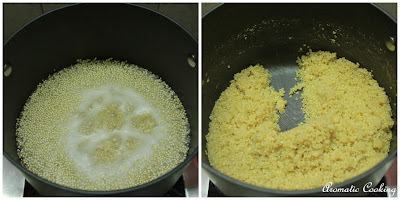 By this time all the water would have gone, but the quinoa should not stick to the pot. Now switch off and leave it covered and undisturbed for at least 15 minutes, until it has cooled down well. Remove the lid, fluff it up lightly and it's ready to serve. 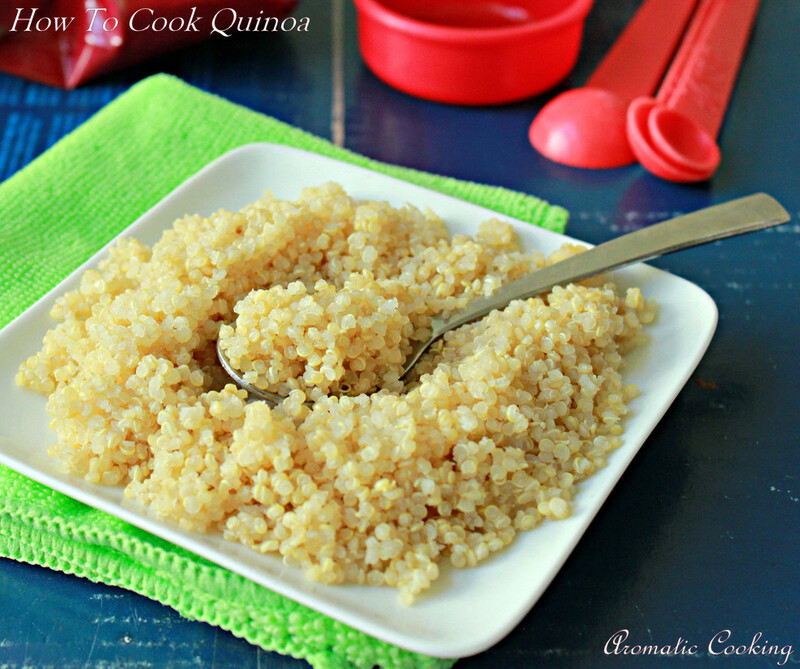 There are a couple of varieties of quinoa, I have used the white variety which is the most common one. When I say medium heat for cooking, there should be enough heat for the water to be boiling slightly, but it should not boil over when it's cooked with the lid on. When you cook less quantity in a relatively large pot, add an extra half cup or more of water, I realized this when I tried cooking 1/2 cup of quinoa in the above same pot, since the water dries away faster. Also depending on the texture or the softness of the quinoa needed, the cooking time can increase by a couple of minutes, you'll work out what's best for you, when you cook it a couple of times. never tried quinoa before.. thanks for sharing how to cook it..
Quinoa is cooked perfectly. I pressure cook it and it becomes mushy.. Will follow this method from next time onwards..
this is so helpful hema ! I was wondering what s the right way to cook it and glad u posted it.. How do u cook this a rice cooker,,any tips? & do u get this in india? nice post dear...thanks for sharing.. Very helpful. Thanks. Heard a lot about it.I have yet to taste it and use this - not sure whether this is available in India.